Vouliwatch is a non-partisan parliamentary monitoring organisation created in 2014 in response to the rising disillusionment of a large segment of the Greek population towards parliamentary democracy and the broader Greek political system - which is characterised to a large extent by lack of transparency, accountability and corruption. Roleplay's mission has been to rethink, restructure, redesign and rebuild the existing platform in order to take the citizens' interaction with the parliamentary work a step further. Representative democracy has never been so direct: An all-new mobile friendly question form has been created for citizens to reach up to 10 representatives. Full with easy to use tools to find the right MPs and set up the question with tags, links and categories. Easy access to the form from anywhere in the platform and third parties via the widgets. The core of the new Vouliwatch is the excesive list of Members of the Greek parliament since the 3rd Republic was established in 1974. Navigate through the MPs metadata, behaviour and income statistics and ask them questions. Following the parliament's law making procedures has never been so real-time and in-depth. View full results by name and locate MPs that deviated from the parties' majorities, those who remained neutral and those who were absent from the procedure. 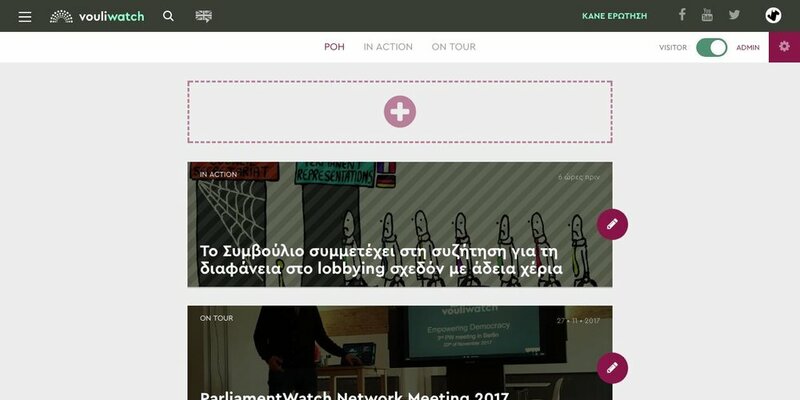 The new Vouliwatch features daily posts on parliamentary activity, weekly resumes on the most interesting topics as well as monthly reports in the form of infographics. One of the biggest challenges has been to migrate — and sanitise — a vast collection of data hosted in the previous database. 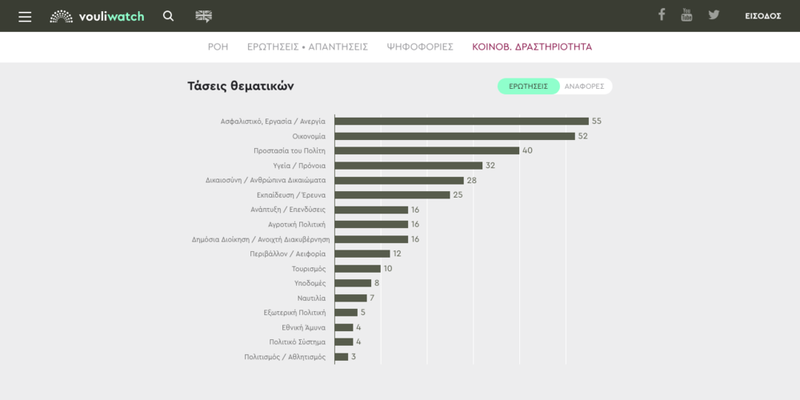 As soon as the data were here, no commercial content management platform seemed fit for the complexity of the greek political system! We therefore designed and implemented an inline dashboard and content editor.